NEW YORK — The Washington Post. Time Magazine. The Atlantic. The Village Voice. The Los Angeles Times. All American media icons, all bought by billionaires in the past half decade. Some are thriving. One died. On the rest, the jury's still out. Still, for beleaguered news organizations the prospect of a deep-pocketed savior — even from the very same tech industry that has kneecapped the media's traditional business model — is all but irresistible. But success is not guaranteed. And risks run from industry outsiders making poor business decisions to exposure to undue influence on editorial operations. For the billionaires, meanwhile, ownership of storied magazines or newspapers provides an alluring combination of a trophy property, a high-profile opportunity to demonstrate their business acumen and a chance to display highbrow civic-mindedness. "There is nothing more satisfactory than seeing your name on top of a masthead as publisher or editor or owner," said Samir A. Husni, journalism professor at the University of Mississippi. While some new billionaire owners say they are doing it for civic purposes and to ensure that journalism will continue as an institution, at the end of the day these folks are still businesspeople, Husni said. If their investments don't work out, it's not guaranteed they'll want to run publications as charities. Billionaires are accustomed to success. But they also have enough money to fail. That includes tech magnates like Jeff Bezos, who bought The Washington Post in 2013 for $250 million, or Marc Benioff, the Salesforce CEO who just snapped up Time Magazine for $190 million, and even Steve Jobs' widow, Laurene Powell Jobs, who has acquired a majority stake in The Atlantic. Benioff told the technology journalist and New York Times columnist Kara Swisher this week that he sees Time magazine as a startup that's been "opportunity constrained." "But we are here to unshackle them," he said. Having these tech titans enter a centuries-old industry could help bring in fresh ideas and new blood, not only reinventing the magazines and the newspapers but also the ages-old business model of relying on advertising for revenue, Husni said. "What they see even more than even people in legacy media," he said, is the need to change the industry's business model. Still, a deep-pocketed newspaper owner who has civic duty and a higher purpose in mind may be more forgiving if that newspaper doesn't immediately turn a profit, or if that profit growth is in the low single digits. Bezos has said that the Post is profitable. But even if it weren't, the world's richest man — whose own company Amazon.com Inc. did not turn a profit for years — would likely be more patient than a hedge fund or even Wall Street. For many of the recently purchased media companies, it is too soon to tell whether their new owners are content waiting for years. "They want publications to be run in a businesslike way and not be throwing money around and owing money," said Rick Edmonds, media business analyst at the Poynter Institute. "That would sour them." Joe Ricketts, the founder and CEO of TD Ameritrade and owner of the Chicago Cubs, shut down two popular New York news sites last year citing business reasons — a week after their staffs voted to unionize. He founded one of them, DNAinfo, in 2009 and bought New York's Gothamist earlier in 2017 (Gothamist was later purchased and restarted by the public radio station WNYC). "That was a pretty clear case of a business person choosing to exit the business because of the business problems with it," Edmonds said. New York's iconic Village Voice closed down last month after 63 years of Pulitzer Prizes, muckraking investigations and its infamous personal ads. Its publisher, Peter Barbey, whose family made its billions in the textile and apparel industry, bought the alternative weekly in 2015. Barbey wanted to save the Voice after a series of ownership changes, staff departures and losses in readership and advertising that had left it in a state of perpetual peril. He shuttered the print edition last summer in an attempt to save money. It didn't save the Voice. "Like many others in publishing, we were continually optimistic that relief was around the next corner," Barbey wrote. Longtime media analyst Ken Doctor said the new wealthy owners sometimes forget that it's not the decline of an individual company, but an entire industry, they are witnessing. "It has been on the decline for a decade and no one has turned that around," Doctor said. John Henry, the principal owner of the Boston Red Sox, paid $70 million for The Boston Globe in 2013, but five years later he is still trying to turn the paper's business around. 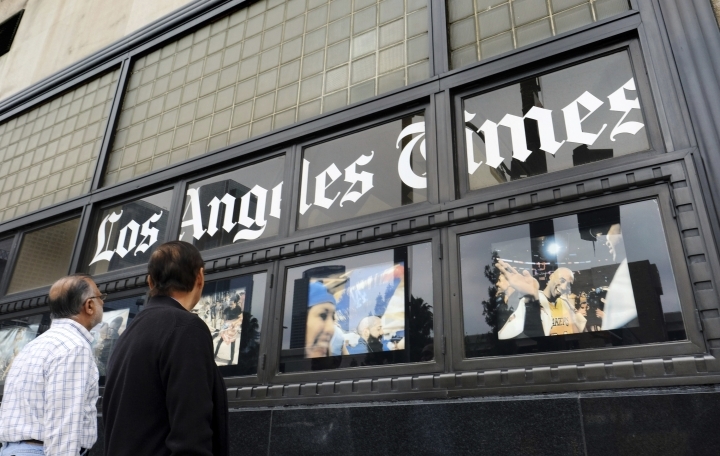 Biotech billionaire Patrick Soon-Shiong bought The Los Angeles Times and other newspapers this year for $500 million, saying they are "more vital than ever" and calling fake news "the cancer of our times." But Soon-Shiong also acknowledged that digital shifts "pose an existential threat to the traditional newspaper industry" and that the newspapers "must be run as a business in order to grow and thrive." Bezos didn't want the Post at first, when a friend first approached him about buying it. "I had no intention of buying a newspaper," he said earlier this month at The Economic Club of Washington, D.C. "It never occurred to me. It wasn't like a childhood dream." He said he changed his mind because he realized it was "an important institution." That purchase has received steady criticism from President Donald Trump, who says Bezos is using it as a mouthpiece to support Amazon. The newsroom says Bezos stays out of editorial decisions. 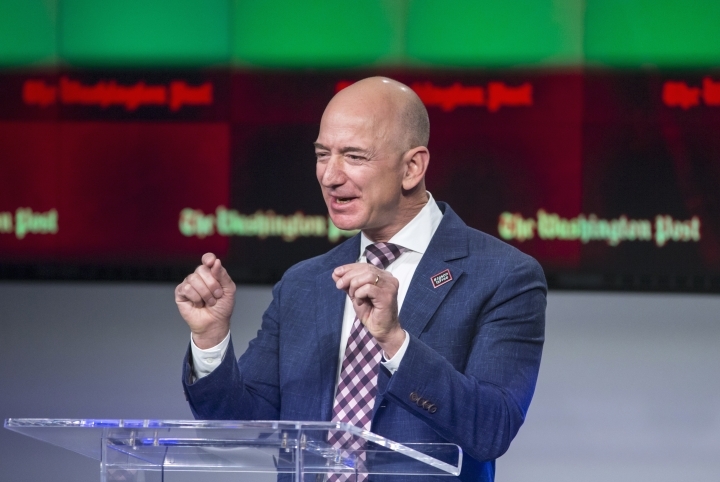 "It is the newspaper, in the capital city of the most important country in the world," he Bezos said. "The Washington Post has an incredibly important role to play in this democracy." Associated Press news researcher Jennifer Farrar and AP Business Writer Joseph Pisani contributed to this story.